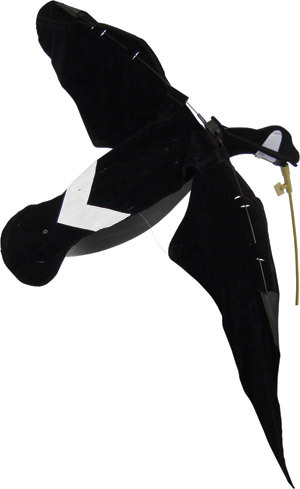 These Sillosock Canada Wing Beats decoys come with a 3 stage switch: on, off or intermittent. Wing Beats are a great way to add realistic movement to any decoy spread. Lightweight, portable and cost effective. They come with a 15 foot wire to connect to any 12 volt battery. In the on position the decoy will flap continuously. In the intermittent mode the decoy will flap for 5 seconds then off for 20 seconds until it is turned off or the mode is changed to full flapping mode. 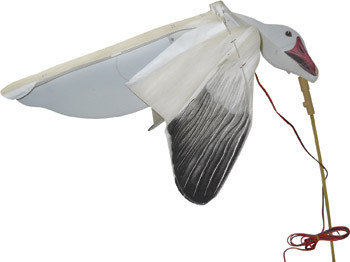 These Sillosock Snow Goose Wing Beats decoys come with a 3 stage switch: on, off or intermittent. Wing Beats are a great way to add realistic movement to any decoy spread. Lightweight, portable and cost effective. They come with a 15 foot wire to connect to any 12 volt battery. In the on position the decoy will flap continuously. In the intermittent mode the decoy will flap for 5 seconds then off for 20 seconds until it is turned off or the mode is changed to full flapping mode. The Super Goose Flapper HDi is bound to change the way you hunt. With an innovative and patent pending design, the Super Goose Flapper has an increased range of motion that is as natural as it gets. This is the first Goose Flapper to operate on a Lithium-ion battery, which means it can withstand any weather and provide more consistent power. The battery and remote receiver are stored in a completely sealed battery box that keeps weather out. Module has external charging, on/off operation, and remote program. 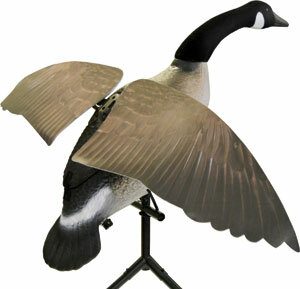 This flapping wing decoy is meant to be used similar to a flag by keeping the focus away from the hunter and blind. The magnetic wings are reversible, with life-like wing print on one side and solid black on the other for long range visibility. Made of durable EVA plastic to resist cracking, flocked head for added realism, and 5 speed settings that are controlled by the HD remote. Goose Flapper has a wing span of 50” and the head is 25” off the ground. 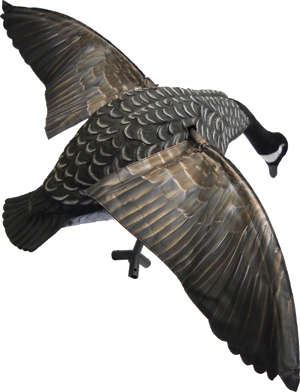 Lucky Flapper Canada Goose Flapping Wing Decoy with Remote. 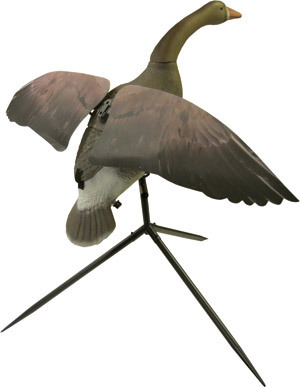 This Life size Canada Goose Decoy has a Flocked Head, Durable flapping magnetic EVA wings for easy setup. Comes with Remote Control, 12V battery, charger and metal tripod base. Runs continuous or intermittent-3 seconds on, 10 seconds off and has Variable speeds. Decoy head is 36” off the ground and a wing span of 43”. Remote range up to 100 yards-Decoy Runs up to 9 hours continuous on 1 charge. 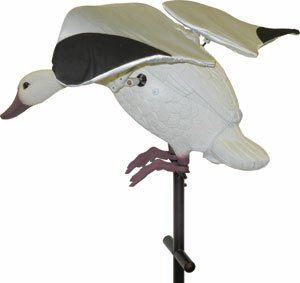 Flapping Wing Snow Goose Decoy with durable EVA magnetic wings for easy setup. Variable speeds 6 volt battery, charger & 3 piece - 42” stake included.